Taken together, these gave me some ideas that I want to jot down. So here they are. This system below is meant to replace the classes (that is, characters would just accumulate perks from the list). +1 hit die. This is a d6. Max hit dice is 10. +1 attack bonus. Max attack bonus is +10. +1 spell slot of level N. To qualify for a spell of level N, you must already have N + 1 spells of level N – 1. For example, to take a third level spell slot, you must already have two second level spell slots. The number of slots for spells of level N must always be less than the slots for level N + 1. The first time you take this benefit, you also gain the read magic and scribe scrolls abilities. A color of magic system would work well here too. Maybe call spell levels ranks to distinguish them from experience levels. Advance a rank in turn undead & demons (whatever that means); the first time you take this, you gain the ability to scribe protection scrolls based on some subsystem. +1 bonus to AC. Max +5. AC can never go below 0 no matter what (or above 20 if using an ascending system). Thief ability: pick or roll. +1 backstab multiple. Default is 1. Max 5. Psionic ability: pick or roll. Long list of feats or whatever (easily ignored by those of us that like simpler systems). 0 level characters have one d6 hit die. When making a first level character, pick two benefits exactly as if you were gaining a level. Max level is 25. I first thought 20 would be nice and iconic, but 25 is required so that a dedicated magic-user can gain the ability to prepare sixth level spells (well, 22, but the magic-user might want an extra hit die or something along the way, and 25 is a nice round number). Use your favorite XP progression table. Actually, you could set the max level to reflect whatever power level you want the campaign to top out at. Anyone can use any weapon and any kind of armor, but there are drawbacks (chance of spell failure, penalty to thief skills). If you don’t put ranks in the combat competencies, that two-handed sword is not going to do you much good. Layer on races at the beginning if that’s your kind of thing. Humans would probably get one or two extra benefits at first level to compensate (depending on how interesting the racial bonuses are). To get a truly schizophrenic interesting character, you could even roll on the benefits table during level-up rather than choosing. I actually wouldn’t be surprised if Fifth Edition does something somewhat similar, as it would allow the game to include 4E style powers as a replacement for something like a standard attack bump. This would make a traditional fighter compare favorably in terms of power levels to a fighter built with lots of powers and maneuvers. If the 5E designers go in this direction, I’m guessing it probably will not be quite as open (as in, there will probably be a suite of options per class, like in Zak’s post). This entry was posted in Uncategorized on March 15, 2012 by Necropraxis. That looks like a pretty sane proposal for D&D without classes. This reminds me of a post guy made way back about how he introduced D&D to his son. I believe it was 3rd ed. Basically he had him play as a hero class with the BAB and feats of a fighter, skills of a rogue and the spellcasting of both a cleric and Wizard (shared spell slots though). He let him play that for a few levels then as he grew stronger he had him choose which aspect he wanted to level up as: fighter, rogue, wizard or cleric. Since he had had been playing as superhero the last few levels he got a taste of what he liked and what he didn’t so the choice was pretty easy for the young lad. 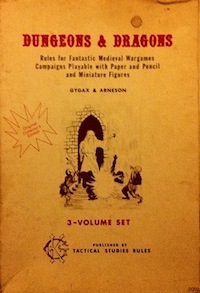 Reading this DM Dad’s quick rules hack made me realize this was probably the spirit of multi-classing intended in 3rd ed but, was never quite quite initialized by the actual designers/text. I liked his idea but I never actually tried it out, it was more suited for solo games anyways. You’ve taken that simple premise and streamlined it a bit to make it very well suited for cooperative play and new players alike. If they come across a hurdle they cannot overcome or a challenge that nearly proved the death of them I’m sure they’d invest in the relevant perk. It also means that the characters won’t have a full gamut of abilities that may never come up in play depending on the campaign, Turn Undead I think is a prime example of this. Very cool. I was thinking about this sort of thing last week, and your system actually seems to work pretty well. One thing you might want to add: Saving Throw bonus. Yeah, that’s a good idea. One base table by level is probably how I would do it, and have an option which allowed +1 to all saves (to replicate how the dwarf and halfling saves work) with some limit on the number of times it could be taken (probably cap at +3 or +5). Alternatively, one could limit the bonus to a single kind of save, but that doesn’t seem competitive with another hit die or spell slot.